Kampala — Government is investigating reports that a top Venezuelan politician had used a Ugandan passport to smuggle his son to China, following heightened political tension in the South American country. Daily Mail, a leading British tabloid, yesterday reported that 17-year-old Tito Cabello, the son of Diosdado Cabello, the leader of Venezuela's National Constituent Assembly (ANC), flown from Cuba, through Russia to China. His sister, Daniella Cabello, also allegedly used a US passport to Shanghai on Sunday, where they are reportedly joining other several supporters of the embattled Venezuelan President Nicolas Maduro, who are fleeing tension in Venezuela. The article claimed that both children boarded the Havana to Beijing flight as Desiree Contreras and Tito Contreras, apparently using their mother's surname to hide their identities. But Kampala officials said they were trying to verify the reports. Mr Jacob Siminyu, the Internal Affairs ministry spokesperson, said: "We are in a meeting and we are going to issue a statement." The Internal Affairs Minister, Gen Jeje Odongo, also said he was in a meeting and was not free to talk. The Permanent Secretary of Foreign Affairs, Mr Patrick Mugoya, said: "I don't want to speculate. Please ask Internal Affairs which issues passports." The Daily Mail article said the siblings left Havana, Cuba, on Friday and reached Moscow on Saturday before connecting to a Beijing-bound flight that arrived on Sunday. From Beijing, Daniella and Tito Cabello then got on a flight to Shanghai at 10:40am local time and touched down at 1pm local time. The Uganda's Deputy Head of Mission in China, Mr Henry Mayega, said it was late in China and promised to crosscheck the matter later in the day. "It's late now, we shall cross-check tomorrow," he said. However, the Director General of External Security Organisation, Mr Joseph Okello Ocwet, doubted the authenticity of the story. "I have read that news from the internet and I'm still doubting if it's true. It is very strange because we have completely no connection or close relations with Venezuela," he said. 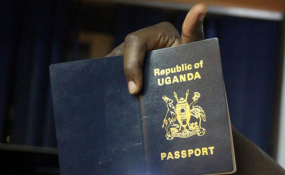 A number of senior officials at the Directorate of Citizenship and Immigration Control have either been arrested or sacked in connection with issuance of Ugandan passport to foreigners or criminals. In April last year, an Eritrean national Medhaine Yahdego Mered, who had been named one of the most wanted man for human trafficking was arrested while travelling on a Ugandan passport. However, the State Minister for International Relations, Mr Henry Okello Oryem, said government has put strict regulations on issuance of Ugandan passport and doubted the Venezuelan would have accessed it. "I don't believe this story because even if he had a Ugandan passport, he would still need Chinese Visa which would be hard for him to prove that he is Ugandan. I find this story hard to believe," he said.